Speaking to the European Parliament in Strasbourg as part of a series of contributions by national leaders to a debate on the future of the Union, Conte stressed the continued commitment of Rome's populist government to EU integration - a commitment some doubted after the coalition's election last year. 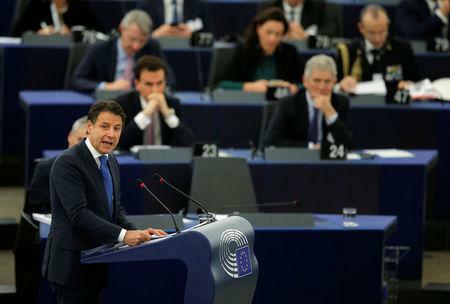 "The powerful opposition that the European people, in its various forms, is demonstrating in the face of the elites speaks to our consciences and reminds us that politics, too assertive on economic rationales, has not done its homework and has given up on its mission," Conte told the assembled lawmakers. Insisting his administration was keeping its "accounts in order", Conte said it was also seeking to stimulate growth. But leaders of mainstream political groups, whose Italian allies found themselves excluded from power in Rome by the rise of the populist League and 5-Star Movement coalition, lined up to criticize Conte's government. They objected to Rome's straying from euro zone budget rules, passing measures against asylum-seekers or siding with Russia to thwart EU support for the opposition in Venezuela. While Conte himself rejected charges from the floor that he was a mere "puppet" of the League and 5-Star, his far-right Interior Minister Matteo Salvini, leader of the League, also leapt to his defense. He called it "shameful" that "European bureaucrats" had "insulted" not just the premier but all Italy. "The European elites (are) against the choices of the peoples," Salvini said in a statement. "Prepare the crates. On May 26, the people will finally send these folks packing." "We should not be afraid of conflict. We should show that we can control it," Conte said. "We should not oppose change with sterile and damaging conservatism. Instead, we should allow conflict to emerge, to demonstrate - in democratic forms -- its propulsive force." On a day when Rome also irritated Paris by questioning the need for a new Alpine rail link, Conte appeared to tweak French interests by calling for a combined EU permanent seat on the United Nations Security Council. Barring soon-to-be ex-EU member Britain, France is the bloc's lone voice on the global body. Over nearly three hours of debate, tempers flared at times. Anti-EU members spoke in Conte's defense and the chamber's speaker had to ask his fellow Italians to mind their language. Manfred Weber, German leader of the main conservative bloc in the European Parliament, accused Conte of running an economic policy based on high borrowing and slow growth. Socialist leader Udo Bullmann accused Rome of showing "the ugly face of inhumanity" toward asylum seekers landing on Italy's shores. Speaking Italian, former Belgian prime minister Guy Verhofstadt, the liberal leader, said his "love for Italy", a founding member of the EU, made it "painful" for him to see what he called the country's "political disintegration" that began with the administrations of conservative Silvio Berlusconi.